SMTS links rural residents with state of the art medical AATT technology through our Long Distance Medical Service. SMTS provides transportation to major medical facilities in St. Louis, Cape Girardeau and Springfield in Missouri and to Memphis, Tennessee and Paragould, Arkansas. This service is used by local residents to fulfill their basic transportation needs. SMTS Local Service provides transportation for shopping, medical appointments, nutrition, recreation, and personal business. 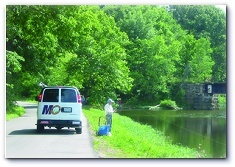 SMTS provides transportation for groups and organizations on a contract basis. These groups include Sheltered Workshops, Dialysis transportation and many others. For the past several years SMTS has been working with various Medicaid brokers on a Medicaid transportation contract. This contract has increased the number of riders SMTS has been able to serve. SMTS continues to explore the possibility of Federal and State Grants, and also to bid on new contracts to help maintain and improve the quality of life for rural Missourians. Are you over the age of 60? If so, you qualify for SMTS’ Contribution System. How does it work? When you board the van, you will be given an envelope that denotes the “Suggested Contribution” rate for your transportation. You simply place your contribution inside and return the envelope to your driver when you exit the vehicle. No one will ask you any questions, nor will they comment on the amount of your contribution, as it is anonymous. Your name will never be written on the envelope. If you have extenuating circumstances and cannot afford to make the suggested contribution, please discuss the matter with our Coordinator, or Area Supervisor. They have a list of resource people who just might be able to help you cover this expense. If they are unable to assist you, please feel free to contact our main office in Fredericktown. We will do everything we possibly can to meet your need. Why does SMTS have to charge for its service? Despite the common misconception, SMTS is not 100% Federally or State funded. The majority of the costs associated with doing business are reimbursable through MoDOT’s 5311 program at 50% of the actual expense we incur. This subsidy allows SMTS to offer a contribution and fare rate that is way below our true cost of doing business. We are required to generate enough local revenue to support the other 50% of these expenses. In addition, in order to maintain a fleet of dependable, reliable vehicles, SMTS must generate 20% of the actual replacement cost for each vehicle, in each county we serve. Therefore, we need to rely on our passengers to help support the system through their contributions and pay fares.